Kylie Johnson, the managing editor at EverythingBackyard, loves to spend all the time she can outdoors. She writes about everything from backyard DIY projects to gardening. If you can’t get a hold of Kylie, she is probably on a trail or a boat. This is her first contribution to 10,000 Birds. Birdwatching is a hobby that many people enjoy, and it’s one that you can experience year-round. 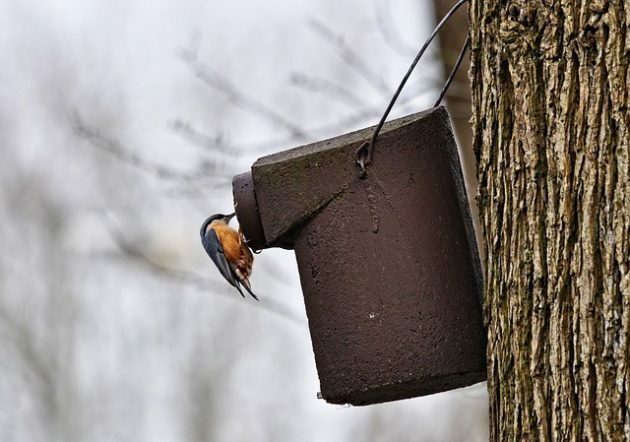 With the right amount of food, shelter, water and areas for birds to raise their babies, you can transform your backyard into a birdwatching paradise. Here are a few tips to get you started. Birds like evergreen trees and shrubs, so make sure that you have a few of them around. These types of plants give birds year-round protection from outdoor elements as well as predators. Native cedar, hemlock, pine and junipers are the best choices to attract birds to your backyard. If you have the space, then group them to give birds density, making them even more tempting. Add vines, trees and shrubs that produce berries to your backyard. When insects die, move indoors or go into a dormant state during the winter, bug-eating birds turn into berry-eating ones. If you plan your landscaping carefully, you can provide year-round lipid-rich food for your feathered friends. Plant wild black cherry, dogwood, sassafras, chokeberry, elderberry or beautyberry plants. One thing that will bring all kinds of wildlife to your backyard throughout the year is access to water. Make sure that it remains available year-round even when cold weather sets in. Fountains are a good source of water. 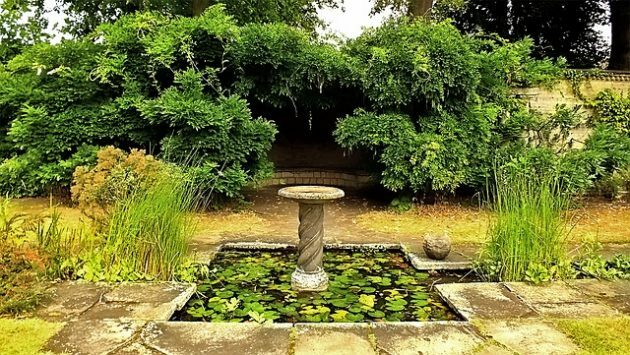 Along with providing wildlife with water, a fountain is also a pretty landscaping addition as are birdbaths. If you go the birdbath route, then select one that limits the depth of the water to an inch. This landscaping addition should also be made from a rough, non-slip material and slope gently to give birds easy access to the water. Moving water is more attractive to birds so consider installing a pump or a dripper in the birdbath. When the winter months arrive, keep water accessible to the birds and other wildlife by heating it with a thermostatic heater. While it does give your landscaping a tidy appearance, mowed grass is not something that appeals to birds or any other type of wildlife. When grass is mowed, nothing lives in it, eats it or uses it as shelter. If you add pesticides, then you’ve turned your yard into a toxic area for birds. Along with making the space toxic, pesticides kill bugs, which are a big part of most birds’ diets. They won’t flock to your backyard if they don’t have a food source. Create a birdwatching backyard paradise by planting more foliage and mowing less. Make a good habitat by tucking a little bit of lawn within your yard’s landscaping instead of adding landscaping to the outskirts of your lawn. Choose a back-corner area of your landscaping where you can let your plants go to seed instead of deadheading all of it to keep things tidy. Don’t rake the area and maybe even let a log rot there. Add a pile of dead tree branches and limbs. To highlight the wild areas of your yard, plant a hedge or install a decorative fence. See if any of your neighbors want to join in. The bigger the paradise, the more birds will be attracted to it. Look for vegetation that produces nectar from spring through fall. Nectar-producing plants will attract bees, hummingbirds and butterflies, keeping your paradise filled with busy little creatures. Go for a variety of nectar-producing vegetation like flowers, bushes and vines. Nectar-producing flowers include coral bells, butterfly weed and wild columbine. Vines such as trumpet honeysuckle and crossvine also make nectar as do bushes like bottlebrush buckeye, ninebark and native viburnums. If you could use a few more trees in your yard, then consider adding ones that produce nectar. Poplar, locust and black cherry trees all make nectar. Birds have the natural instinct to nest, so when you make it possible and easy for them to do so, you’ll be attracting them to your backyard. Nest cavities are something that you can buy from your local nursery or home improvement store. If you have extra supplies laying around, you may want to make a few. Be sure to mount them properly and include predator guards. Doing so will bring wrens, chickadees and tree swallows to your property. 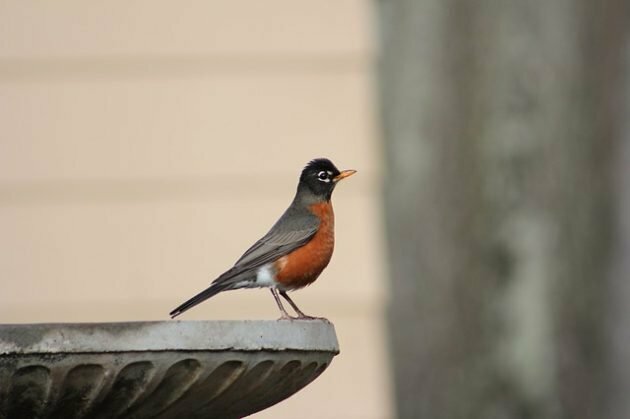 Take a look around your backyard for bird safety. If you invite them onto your property, it’s up to you to ensure that they have safe food and shelter. Check for ways to prevent window crashes and keep your kitty indoors. Make sure that your birdbaths have nearby safety escapes to protect wet birds. Even if your backyard is small, you can turn it into a birdwatching paradise. Be prepared to use containers, and in this case, think vertically. Plant native plants in containers and add hanging baskets and green walls to your small space. You may not attract as many birds as someone with a big space and lots of plants, but you’ll still bring wildlife to your yard. With a little tweaking, you can create your own birdwatching backyard paradise. In addition to gaining the opportunity to watch birds in action, you’re also giving them a safe place to live, one with food and water. Birdwatching is an activity that can rejuvenate the soul. I fit in with your observation that gardeners work around the edges of the lawn. I shall re-visit the masterplan.